Did you notice there is a Full screen mode in Google Docs? If not then you must check that out. With So many features being added onto Google docs lately, It has been becoming a preferred choice for Online Document Editing. But It does look a bit odd to feel like working on Browser, rather than a full scale application such as MS Office (Word to be more specific). So rather than going in for any other application for Freeware Document Editing, why now make and feel Google Docs like a Full fledged application. 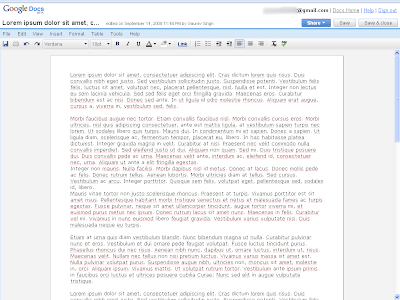 So what we are going to use is the Full screen Mode that has been in the Word processor in Google Docs. All you have to do is open any new document or any existing Document. So for the Google Docs Full screen mode you have to go to the menubar. 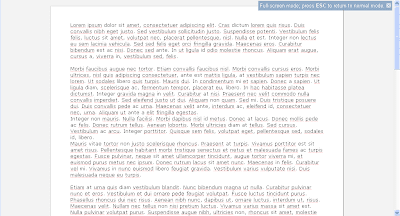 So you can Preview The full screen mode in Docs, which hides up the menu bar, and all the Editing buttons from the Docs. Now if we use another Full screen utility that is present in the Browser, in our case it is Firefox. So when you press F11 your browser, goes to Full screen mode. So when you press F11 you see the view of the whole document on your Screen in Full screen mode. But now you have missed out the various buttons that Google Docs has by default. So just escape out from the Full screen mode from Google Docs, or either do not enter it. Just press F11 and , you have an Application lookalike Google Docs in full screen. Never actually tried Google docs but will give it a shot. Actually for those on the go, Google Docs is a Handy App. Not as fully powerful as MS Word, but yet quite useful tool.